A side scan sonar instrument, or towfish. Photo courtesy of Klein Associates, www.kleinsonar.com. One of the best systems for imaging large areas of the ocean floor is side scan sonar. The basic concept is much the same as the basic echosounder; however, side scan sonar instruments are towed behind ships and often called “towfish” or tow vehicles. This technology uses a specially shaped acoustic beam, which pulses out 90 degrees from the path that it is towed, and also out to each side. Each pulse provides a detailed image of a narrow strip directly below and to either side of the instrument. The topography of the ocean floor and underwater objects reflect back the sound energy to hydrophones on the tow vehicle. These reflections are amplified, processed and displayed as images. Some of the sound that is emitted by side scan sonar is absorbed by the seafloor; the rest is reflected or scattered back in different amounts, which leads to different images of the seafloor. For example, hard objects such as rocks and metal will reflect strong signals while softer features such as mud absorb sonar energy and produce lighter acoustic returns. The the bottom figure (black and white) shows the display anoperator would see. It is a plot of the reflectivity of the seafloor and any objects on the seafloor. Diagram courtesy of USGS Seafloor Mapping Technology group, woodshole.er.usgs.gov/operations/sfmapping. Side scan sonar technology provides high resolution, almost photographic quality imagery of the seafloor. It is commonly used in industry to locate pipeline or cable routes, and to search out small but specific objects that need to be found, such as shipwrecks, mines, or downed aircraft. Side scan sonar is sensitive enough to measure features smaller than 10 cm (less than 4 inches) on the seafloor. It is also good to use when accurate maps of large sections of seabed are needed. 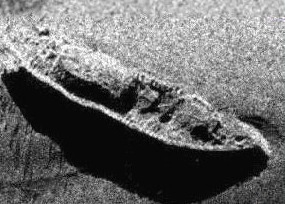 Side scan sonar image of the USS Monitor. Photo courtesy of NOAA. 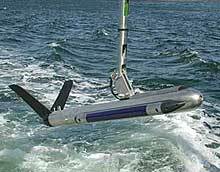 NOAA-Office of Coast Survey, Side Scan Sonar. University of New Hampshire: Center for Coastal & Ocean Mapping.